By now, there's been so many different color variations of the five O.M.F.G. Series One figures released that I've started to lose track. I actually gave up on trying to collect them all a while ago, but was happy to get the chance to review the gold set, one of the latest colors which is exclusively sold through Luke's Toy Store. This is definitely one of my favorite O.M.F.G. colors so far. 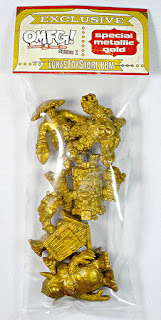 You don't see too many gold plastic mini figures (the only ones I can think of quickly are certain characters released in the Japanese keshi line Necros Fortress), so the five first series O.M.F.G. 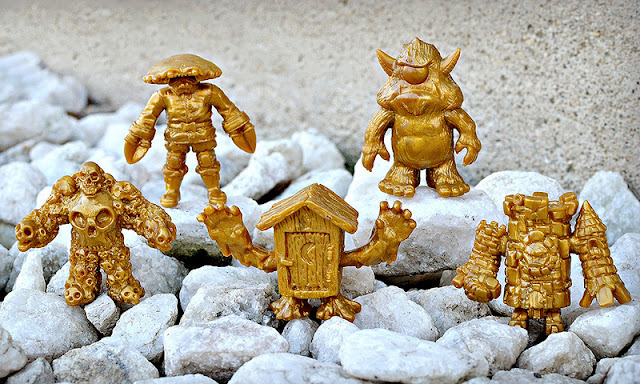 monsters--Crawdad Kid, Stroll, Multiskull, Phantom Outhouse and King Castor--are very eye-catching in this metallic color. Luke's Toy Store currently sells the gold set bagged with a header card for $10.49. This is in line with most of the other exclusive sets and well worth the price. If you don't own any O.M.F.G. figures yet, they're made out of a firm, sturdy yet slightly flexible plastic that makes you feel like you're holding some quality toys, and the gold versions are no different in that respect. 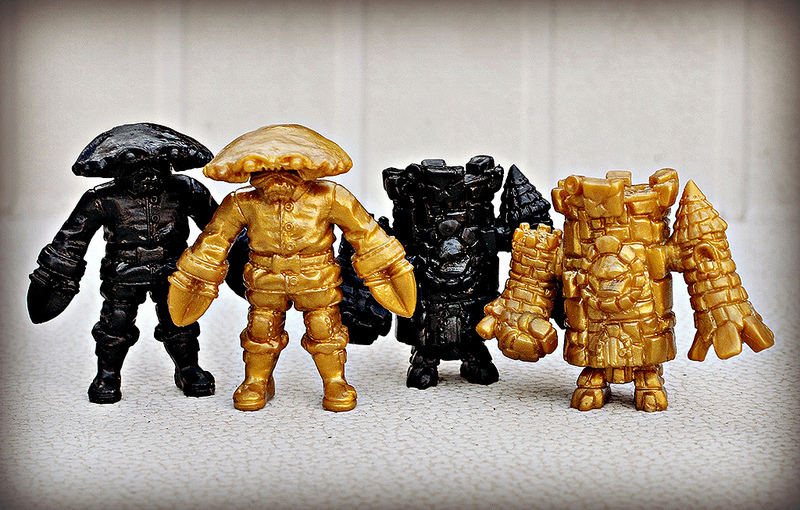 All of the characters look cool in gold form, but my favorites are Multiskull and King Castor. That might be because they're my favorite sculpts of the series in general, but I think the gold color really makes their details pop. All of the little crevices in Castor's castle exterior and the many skulls that make up Multiskull's body possibly stand out more here than they do in any other color released to date, aside from maybe the standard "M.U.S.C.L.E. pink" release. When I was comparing the gold set with all the other colors I own, I noticed that it looks particularly awesome alongside the black set. If you display your O.M.F.G. figures, definitely consider putting these two colors together! The gold sets are limited to 200, so if you'd like one for yourself head on over to Luke's now. The store is also selling the soon-to-be-released second series of O.M.F.G in gold (you can pick up a combo pack of both series in gold for $19.99).